Spencer would have been eleven next month, and he was our much loved companion from August 2008 until this week when he passed beyond the fields we know. He had been diagnosed with osteosarcoma in early May, and the disease rampaged through his system like wildfire. Opiates were no longer holding our sweet boy's pain at bay, and we made the heartbreaking decision to send him off across the rainbow bridge a few days ago. He undertook his last journey on Wednesday with the gentle assistance of his veterinarian, Himself and I holding him close and crying. I hated leaving his dear little body behind for cremation, and I felt like a murderer that day. I still do. 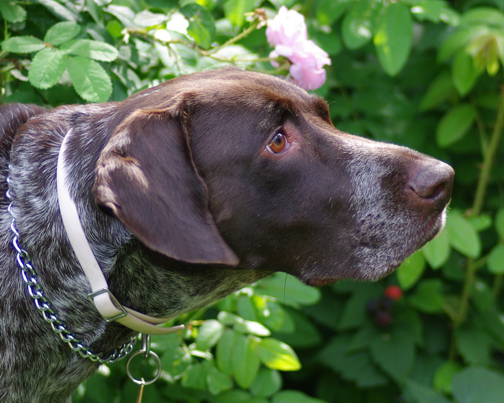 Like most German shorthaired pointers (GSPs), our little guy was highly intelligent, and he was very athletic. He was a strong swimmer, and he ran like the wind, had oodles of endurance and was a perfect sidekick in the woods. On woodland rambles, he was always at my side, and he defended me fiercely against moths, bumbles, dragonflies and grasshoppers, convinced that they were up to no good, and his mum was in grave danger. He liked to run off with socks and slippers, and he excavated gargantuan holes in the garden when the spirit moved him. He understood almost everything that was said around here, and it was difficult to put anything over on him. His elegant nose could sniff out cookies, homemade gelato, bison burgers and Brie at a distance of several kilometers. As a senior citizen, he developed an expressive grumble and wandered around the house commenting resonantly on just about everything he saw. We gave up chocolate because he couldn't have it too. Spence had a heart as wide as the world. He loved us with every particle of his being, and we loved him back with every particle of ours. The house is empty without him, and we can't believe he is gone. His bed, bowls, blankets and toys are where they have always been and where they will stay. There is a hole in our hearts, and a raw wind is blowing through it, but we know his big sister Cassie was waiting for him in the sunny fields beyond the bridge. Please let it be so. Sorry. He was such a bee-utiful beast. Sending gentle hugs of compassion. What a dear, sweet dog. So sorry for your loss. I miss him just from reading your post, that is what a great writer you are. Probably most of your followers have had to say good-bye to a dearly beloved animal companion and we're grieving with you--for your loss, for beautiful, mischievous, elegant and entertaining Spencer, and for the memory of our own departed friends (Sasha, Sugar, Lady who were all born in Africa and who followed me to Washington, DC). So sorry and so sad! I am so sad for you. I still weep for my Taffy, gone four years. This will take time, so give yourself lots of it. How blessed you and Spencer were to have had each other and loved one another so dearly. Not everyone gets to experience something as precious as that. Sending Light to you. And to him. I am so very sorry. All of us who love dogs understand how you are feelings. I wish dogs could live longer. I an very sorry Cate, pets are such a joy, their loss so very deeply felt. So sorry for your loss. He was such a lovely companion. Enjoyed reading about him for these many years.